I have been to Joshua Tree many times, and while there is still a ton to explore on my own, I was excited to get off the beaten path with Joshua Tree Excursions during my last visit. Joshua Tree Excursions is a locally owned company providing privately guided off-trail experiences with the thought that life is about the journey not the destination. It was amazing. Our 5 mile hike was harder than I would normally do on my own, but had the perfect mix of challenge and interesting scenery, combined with a plethora of knowledge shared by our guide Kelly. Kelly, the owner and main guide with Joshua Tree Excursions is a wealth of knowledge about Joshua Tree and nature in general. We received a mini geology lesson providing us background information about how the rock formations in Joshua Tree came to be, along with detailed information about the plants and animals along the trail. This was such a key part of the excursion for me. I can’t tell you how many times we have been to Joshua Tree and never even remotely knew what we were seeing! One of the best features of exploring Joshua Tree is the ability to go off trail. During our visits, we have done this on a small scale, but Kelly is an expert in going off trail, which was exactly what I needed to feel more comfortable delving deeper. Our hike started at the popular Barker Dam, but quickly veered off trail at the dried up dam area. From here, we cruised through the wash before scrambling up rocks to look over what Kelly calls The Cathedral. If this is where our hike ended I would have been happy and satisfied, but this was just the start of amazingness to come. Even at this point I felt nervous scrambling up massive granite rocks, but knew that Kelly wouldn’t take us anywhere that we couldn’t handle as we had a mixed fitness level in our group. Kelly was excellent in helping the slower and more scared members of our group, while also miraculously always appearing in the front to lead us through our next challenge! Coming over to the other side of The Cathedral we were wow’ed by The Cube, an amazingly awesome square rock likened to Star Trek’s Borg. I know nothing of Star Trek, but it was pretty impressive to see what nature can do. Our hike led us up and down more rocks, weaving through patches of prickly pear cactus that acted as gate keepers to this hidden area. At one point, we walked through a dried up river basin that was filled with pine trees, manzanita trees and a diverse array of cactus. It was so interesting to see so much diversity and green so deep in the dry desert. Continuing on through the Wonderland of Rocks, we made it to Garret’s Arch, which is one of the largest documented arches in Joshua Tree. Some of our group were brave enough to climb to the top. I wish I had, but nervousness and tired wobbly legs were getting the best of me. It looked amazing from the top. But I enjoyed my rest at the bottom. Kelly had warned us in advance there would be an ‘interesting’ stretch around the last mile. I think my anticipation of it got the better of me as I began to totally panic while crossing some of the deep crevices in the rocks, with the teeth clincher for me being the round ball like rock that stood in the way of me and my next flat rock destination. I had a total panic. Kelly didn’t even flinch. He so calmly talked me through my near panic attack getting me safely across the crevices as well as helping me to feel empowered to keep on moving. At the time I was still so filled with nervousness, but looking back it was amazing and I would love to test my fear again by doing this hike and trusting myself more than I did on the first time. Of course I still wouldn’t dare wonder in the back country without Kelly as my guide, but it is calling me to visit again. The last mile of our epic hike led us through the Wall Street Mill. I can’t believe I hadn’t explored this area with my son yet as it’s easy to access from a dirt parking lot just past Barker Dam. 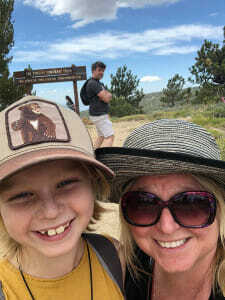 This short hike looks to be awesome for families looking to get a bit off the beaten path without a tremendous amount of time or skill required. We were hours behind schedule and with aching feet so we didn’t flounder around here long, but I enjoyed seeing the old stamping mill and abandoned cars along the path. Definitely a hike to explore more and add to our list of family friendly Joshua Tree hikes. Our guided excursion revealed to me just how much there is hidden behind the main roads and trails in Joshua Tree calling to be explored. Hiking with Kelly was fantastic as he provided the knowledge, power and security I needed to push my boundaries a bit more. I feel like this is going to become even more important as my son grows older and wants to push the envelope outdoors to areas that I just can’t manage. I whole heartily recommend you take the time and spend the money to do an excursion with Kelly. You will not regret it. He organizes everything from day hikes like we did to multi-day backcountry hiking/camping trips. From individuals to groups, you name it, Kelly does it. Prices for private guided off trail hikes start at $125 per person for the first two people and $60 per person up to 7 people. It may sound steep, but will be well worth your money, I guarantee. Thank you Kelly for being my guiding hand, pushing my boundaries and getting me out of my comfort zone. It rocked! Have you hiked off trail in Joshua Tree? Do you have any favorites to share with us? Read our popular Exploring Joshua Tree with Kids post for more information on what to do and where to stay in Joshua Tree. Thank you for your amazing article and praise. It was a pleasure sharing the magic of Joshua Tree National Park with you. We will look forward to seeing you in the future for more exploration and adventures. Thank you again for your kind words and we’ll look for you on the trail! I think I’d really enjoy a day like that! I love using local tour guides and Joshua Tree sounds great. Especially the attention to safety. I did a hike recently in lombok and they just had no clue about keeping everyone safe. Never again! Looks like you had a fab day though – it also looks really hot! I havent been here but I am touring the US now. I might as well drop by. I love that you gave an offbeaten path one. Those are the types of places I want to do visit. The older I get the more I appreciate nature and this looks like a perfect get-away /there are some huge and funny looking rocks among them btw 🙂 I am sure it is also great to be there not among too any other peolpe! Looks like you had an amazing time. It’s always good to explore an area with someone that knows what they are doing. Wow, they offer some great excursions. It’s always great to have reliable travel agency with peole that can connect. Its great that Kelly was professional enough to go off track, and cope with anyone having difficulty during the hike. When trying something physical and new like this I think its quite important to have someone you can trust to walk you through any fear safely! Kelly sounds like a fantastic guide! We visited Joshua Tree last year on a US roadtrip, and had a blast hiking around and exploring independently. I do admit though it’s often beneficial to be traveling with a guide, because they really can provide so much information and knowledge about the area, and it gives you a different appreciation when you have an understanding about a place 🙂 Will definitely look at heading out on a hiking tour when we get back next! We’ve been wanting to visit Joshua Tree for so long–it looks like such a gorgeous area! Sounds like you had a fun hike. We usually go out on hikes on our own, but it is nice to get information on what you are seeing and Kelly sounds like a great and knowledgeable guide! Would be great to check out those tours when we finally are able to visit sometime. I love all the rock formations, especially the Cube!